Last November, SPEAK joined with other charities and Christian groups to kickstart a year of fasting and praying on the first day of every month to make a stand for climate justice. As momentum builds towards a new International Climate Agreement to be signed in Paris this December to stop dangerous climate change, there’s clearly no better time to get to one’s knees. And in September SPEAK has “loud” plans to creatively challenge the Defence and Security Equipment International arms fair held every two years in London. It will be holding a Peace Festival as part of a week of action organised by the Stop the Arms Fair coalition. The prayer and campaigning network has come a long way since it was founded in 1998 by Louise Donkin, then a student at the University of East Anglia. “We wanted to campaign for change as well as demonstrate how we felt God cares for the poor and oppressed,” she said. What started with a handful of Christian students has grown into a large network which continues to motivate students and young adults to strive for social justice. Over the years SPEAK has worked with groups such as Operation Noah, A Rocha, Christian Aid, Tearfund, Oxfam and the student organisations UCCF and Fusion. Together they continue to shine a light on unjust laws and policies in the areas of agribusiness, climate change, the arms trade, economics and corporate accountability. 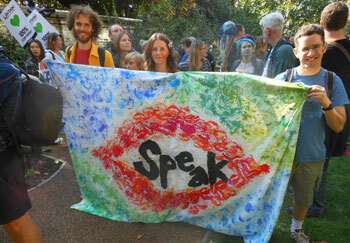 And as they campaign, SPEAK comes up with many creative ideas to voice its concerns and encourage others to act. For example, during this year’s Peace Festival they will also be planting a prayer garden. Every seed that goes into the soil will represent a prayer and a signature harvested during their recent Seeding Change petition calling for food justice in Africa. Just one of the ways this network is striving to bring spiritual, social, economic, political and environmental transformation and speaking up for those who do not have a voice.